The seventh round of negotiations have concluded in Mexico City, Mexico, and the negotiators report closing three additional chapters of the North America Free Trade Agreement (NAFTA). Although the trilateral meeting didn’t close as many chapters as negotiators had hoped, they closed chapters on: Good Regulatory Practices, Administration and Publication, and Sanitary and Phytosanitary Measures. Negotiators also completed work on sectoral annexes related to chemicals and proprietary food formulas and said they are making substantial progress on Telecommunications and Technical Barriers to Trade. U.S. Trade Representative Robert Lighthizer reports that the three nations agreed to include a chapter on energy. Lighthizer reiterated that the two main goals for the negotiations are to update NAFTA to address modern trade issues and to rebalance the agreement. He also stressed the need for negotiations to move swiftly because of upcoming elections. Mexico will elect a new president on July 1. Both Ontario and Quebec, Canada have elections scheduled later this year. The United States has mid-term elections coming up in November. Once all three countries reach an agreement at the negotiating table, the next phase of the process begins. In the United States, after an agreement is concluded in principle, U.S. laws require public disclosure of text, further consultations, and numerous reports before Congress can consider the agreement. “Thus, in the U.S, we must resolve our outstanding issues soon to maintain the possibility of having this measure be considered by the current Congress,” Lighthizer said. The California Chamber of Commerce understands that the NAFTA was negotiated more than 25 years ago, and, while our economy and businesses have changed considerably over that period, NAFTA has not. We agree with the premise that the United States should seek to support higher-paying jobs in the United States and to grow the U.S. economy by improving U.S. opportunities under NAFTA. The provisions of the NAFTA with Canada and Mexico have been beneficial for U.S. industries, agricultural enterprises, farmers, ranchers, energy companies and automakers. Any renegotiation of NAFTA must recognize the gains achieved and ensure that U.S. trade with Canada and Mexico remains strong and without interruption. 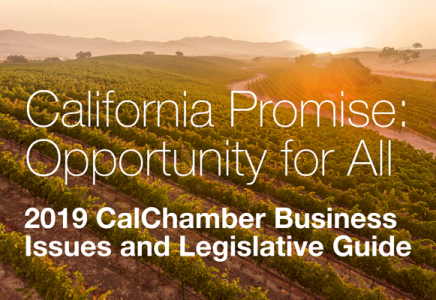 The CalChamber actively supported the creation of the NAFTA among the United States, Canada and Mexico, comprising 484.3 million people with combined annual trade with the United States being around $1.069 trillion in 2016. In 2016, goods exports exceeded $496.919 billion while goods imports totaled nearly $572.217 billion.